For this giveaway, I’m working with the website Big Kitchen. With my crazy schedule and my propensity to take on way to much, most of my shopping is done online at the end of the day. Big Kitchen has just been added to my list of sites to browse in the free moments that I do have. Along with the wide array of items that you would expect from an online kitchen store, they also have a good selection of items made from recycled and sustainable materials. And I’m sort of in love with these bowls and I want this because it reminds me of The Wizard Of Oz, and how have I lived my entire life without one of these? The lovely people over at Big Kitchen sent me a set of Alligator Dicers to play with, that I have since started to refer to as my “Food Chompers.” AND they are also going to send a set, one small and one big, to one of you! SO nice. One Large Alligator Dicer, and one mini dicer. I used my iPhone for a scale reference to get a more accurate idea of size. 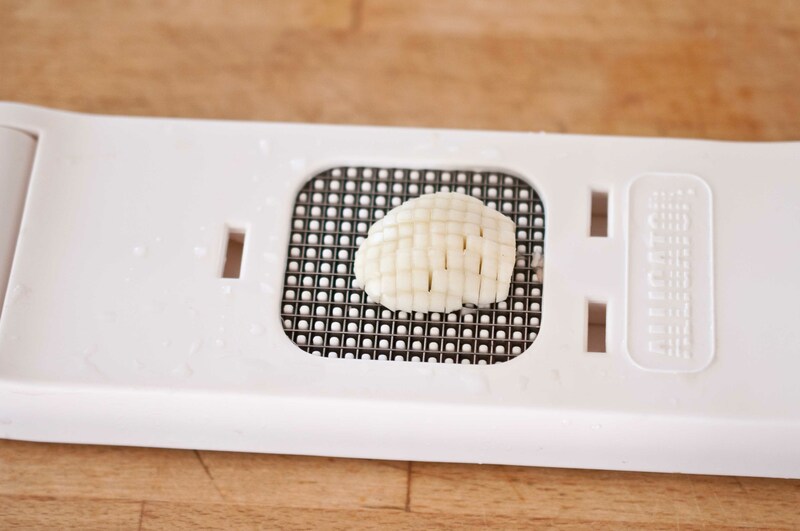 There is a mushroom, cut in half and place on the chomper plate to show you the size difference. To use the chomper, just place the food on the plate, and press down, the food that is diced goes into a collection bin that is attached. 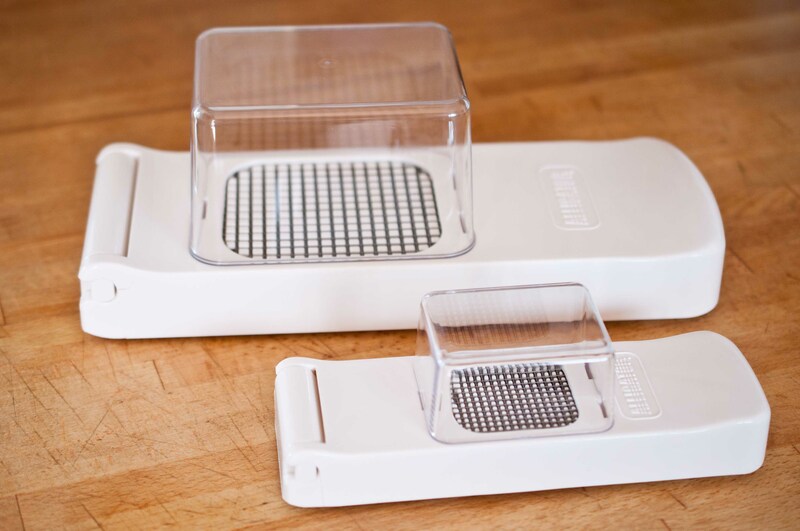 The Mini dicer is above, and the large dicer is below. Here are the two collection bins side by side. 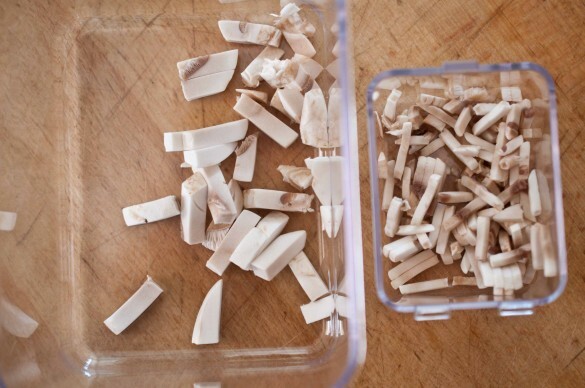 As you can see, with a half of a mushroom (or if you used a whole mushroom for that matter, you don’t really get a dice as much as “strips.” I like this cut for the Quinoa salads I seem to make 5 times a week. I also Chomped a bell pepper, and asparagus spears and those gave me a really great, consistent dice. The best use for the Alligator Dicers is garlic and onions. 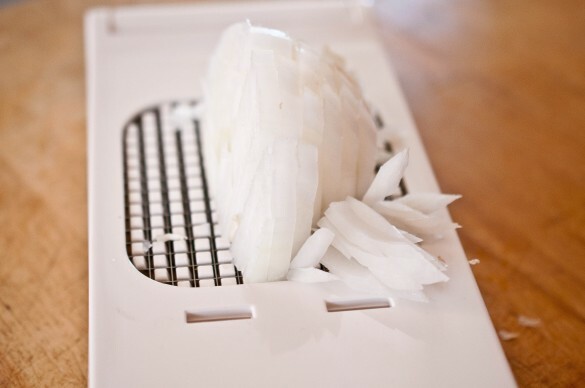 I tend to need minced garlic and chopped onions on a near daily basis, and these dicers do a fast and efficient job. This is especially helpful for those recipes that call for 6 cloves of garlic, minced and 2 onions, chopped. Not only a huge time saver but all of the pieces are the same size, which is important to insure that they cook evenly. For the below recipe, I chopped: red bell pepper, asparagus, zucchini, garlic, onions, and mushrooms. The dicers cleaned up easily with a hand washing and are small enough to store just about anywhere. While I do really love having these, I will probably still just use a knife if I have only a few vegetables to chop. 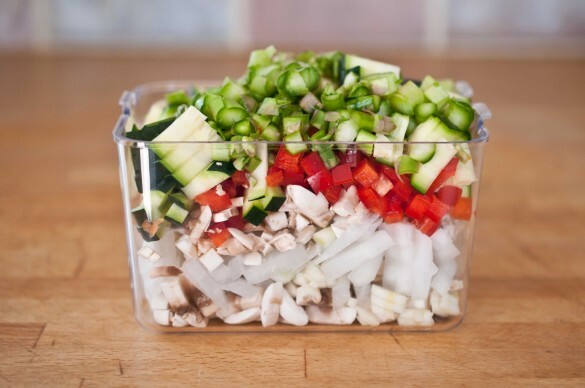 When it comes to those recipes that call for a large amount of diced vegetables, these dicers are great to have around. To enter the giveaway, just leave a comment on this post. Unfortunately, we are only able to ship to US addresses. Giveaway closes at 3-27-12, at 5:00 PM, PST. This is an easy, weeknight meal that you can throw together in just a few minutes. I used the vegetables I chopped with the Alligator Dicer as toppings. Bake for 10 minutes or until the puff pastry has turned a light golden brown. Remove from the oven and top with sauce, then mozzarella cheese, then all of the chopped vegetables and then dot with goat cheese. Number 31, you can now dice to your hearts content with your brand new Food Chompers! Looks awesome! 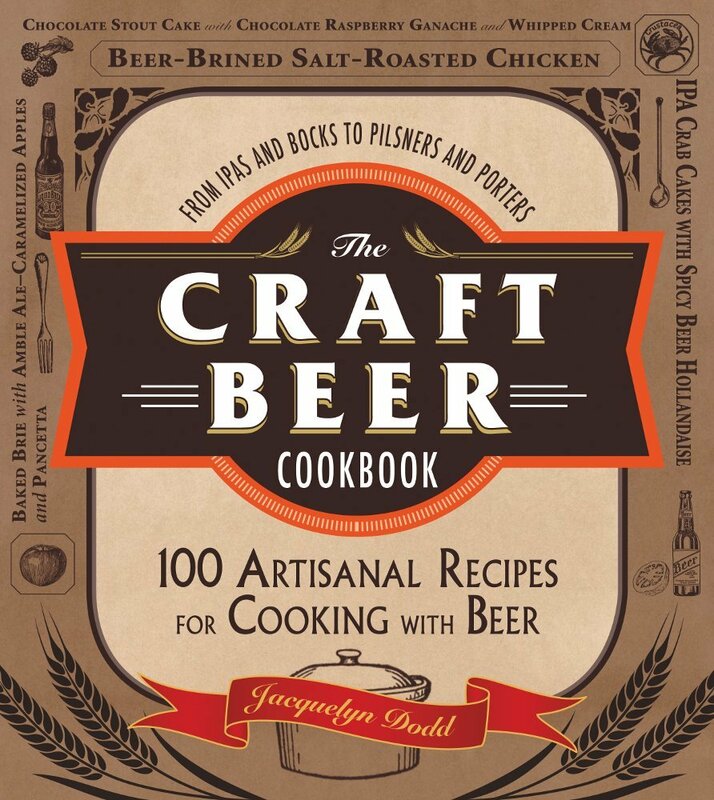 can’t wait to check out the site and the recipe! What a great giveaway. 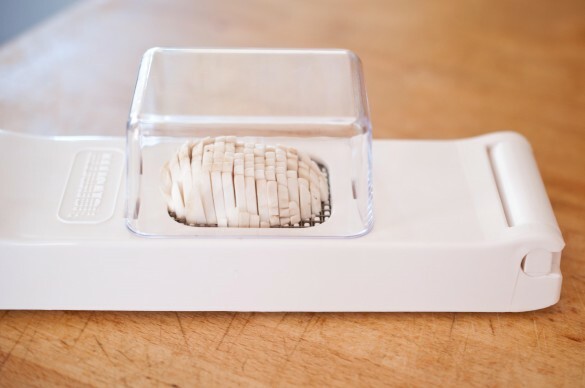 These dicers seem like a real time saver! 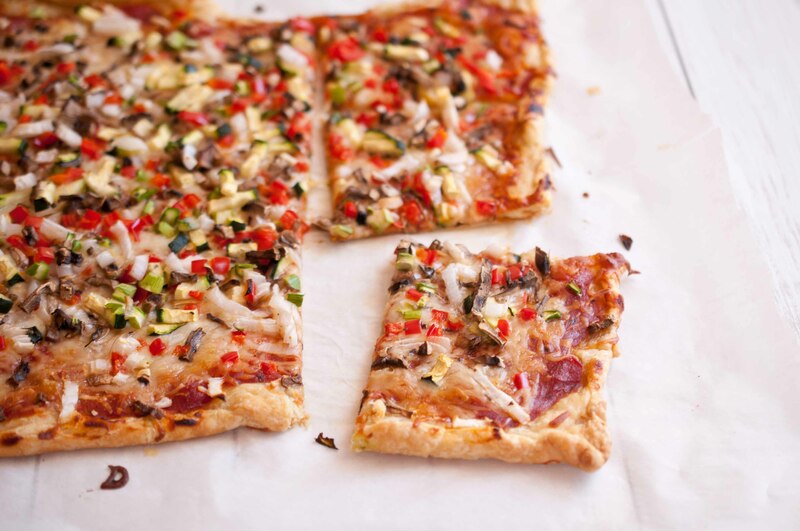 I also love the idea of using puff pastry as pizza crust…simple and delicious! I love the look of those slicers! And puff pastry for pizza – yes please! This little chopper is perfect for pizza toppings. The pizza looks awesome! I have been looking for some delicious to do with some leftover frozen puff pastry! Fabulous! ooh, love the idea of doing a puff-pastry pizza! i have a sheet of puff pastry i’ve been wanting to use up + that’s a great use of it. also, fun giveaway! I would use these constantly, what a great idea! Oh, my goodness! I’ve been looking for something similar to these! Chopping onions kills my eyes and I’d love a quick and painless way to do it. Looks like a very handy gadget! Your pizza does look fabulous, wish I had a piece! I like that there is goat cheese as well as mozz on there-yum! 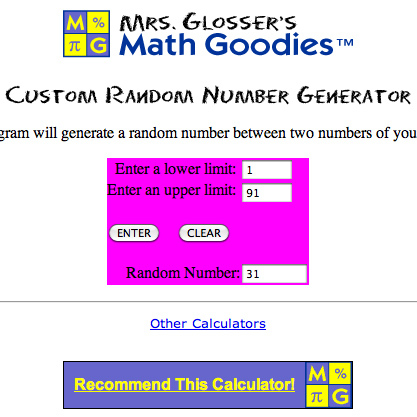 Sweet of you to do this giveway, but I already have a dicer/slicer, so good luck to the entrants. However, I will need to pop into the Big Kitchen just to see what else they have. Enjoy the day! what a neat idea! your pizza looks delicious – i love black olives on pizza – yum. Love, love this recipe! I will be making it! I hate chopping onions and this does a fine job. The pizza looks terrific! My first thought when I saw the picture of the pizza is “that looks awesome” followed by “ugh, there’s no way I can do all that chopping after work between homework and practices for four boys.” I guess the chopper is the answer! Whoa, I would have so much fun with those chompers! Your pizza looks fantastic! Oh my gosh, that thing looks so cool!! This would be so useful! It would make preparing my meals go so much quicker. I love the oil can! Gonna try this recipes tommorrow. Looks fantastic!!!!!!!!!! Looks really useful, thanks for this giveaway! WOW, now this would make life a little easier! Thanks for the opportunity! leahtardo (at) gmail (dot) com – thanks! This pizza sounds fantastic! And I love the chopper! I’d totally cook more, and healthier with that! I love to cook and this would be a big time saver!!! Your blogs are GREAT!!! I’ve really learn alot from you!!! This sounds like one of my favorite pizzas from a local restaurant. I’ll have to give it a try at home! Lovely giveaway. The puff pastry pizza looks incredibly delicious. I just moved into my first house and this will really help build up my kitchen!!! what a pretty and colorful pizza! I’ve never seen these before. What a great timesaver. 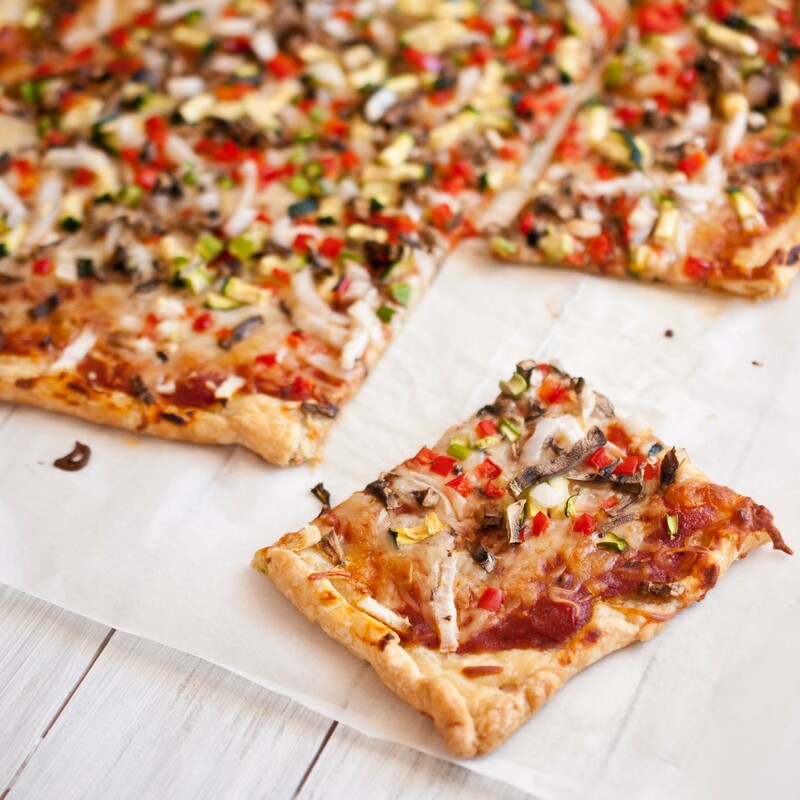 I love the idea of using puff pastry for pizza! This looks delicious! I never even thought of using puff pastry as a pizza base but it’s a great idea! This is a great idea! I’ve been making pizza out of whole wheat tortillas but this is an easy idea for when company comes over, plus totally customizable. The give-away is an awesome perk! Great addition to any kitchen! I would love the “Alligators”!! My Sister has the smaller one, it is AWESOME for garlic! I’m thinking of making the pizza this weekend…great idea for the crust!! Thanks for the contest! This looks so great! I can’t wait to try it! You’re right, those bowls are absolutely beautiful. And I love the pizza, it looks delicious. The chompers are very cool! The pizza looks terrific-I like the idea of using puff pastry. Love the recipe. Pretty healthy with all the vegetables! Love that! Love the choppers!! Definitely going to try this, it looks delicious! That pizza looks scrumptious! I love the idea of using puff pastry as a base! Not only does the pizza look delish, but I love that you reviewed the “chompers” with pics! It’s easy to get sucked in by infomercials at 2 AM (trust me! ), but your presentation sold me. I haaaaate chopping veggies. This gadget looks so neat! Can’t wait to try this pizza. I love pastry crust! This looks so light and delicious! And I love the idea of using puff pastry as the crust, so simple!! I would love to try those chompers! looks like a major timesaver!! and thanks for the pizza recipe…looks delicious! How awesome! What an easy way to prep. And the pizza looks delish! Saw this on food gawker. Looks delish. And the chompers look great too! I’m going to make this pizza tonight! What a great idea for the crust! Lazy, fast and good dinner!! So awesome! I love puff pastry and had never thought to use it for pizza. Great idea! Thanks so much for sharing! The alligator dicers would be such a time saver for me…especially during the summer months for all of our fresh garden veggies. 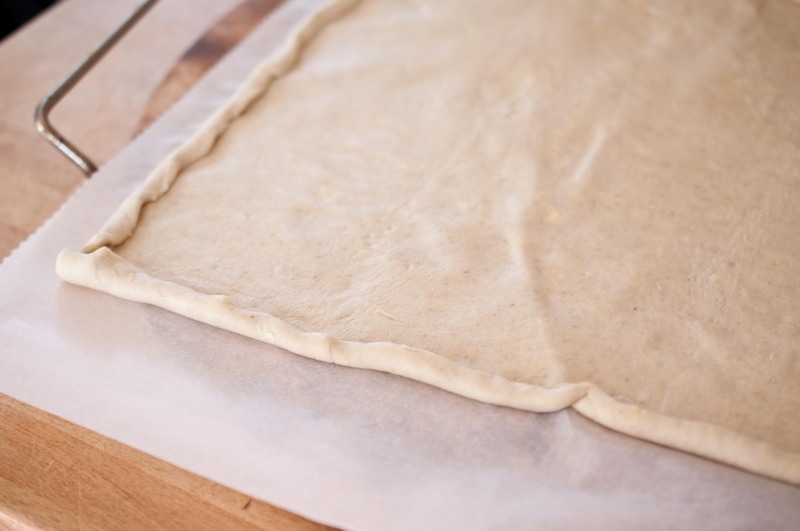 i love the idea of puff pastry for a crust!! Beautiful pizza! I’ve loaded it to pinterest as one of the recipes I’ll be trying soon! I really want to try this recipe! The puff pastry is intriguing… Thanks! They look awesome, hope I win! What a colorful pizza! I love it. It may not be a true dice, but the uniformity of the cuts gives the food a more professional look to it. Looks yummy! I can’t wait to try out this recipe! I love the idea of using puff pastry for the crust and I would love to win the “Chompers”! I really like that they chop everything uniform. Oooo, I never thought of using puff pastry for pizza. Sounds incredibly yummy! We make a lot (okay, maybe too much haha) of pizza in our home – this would be such a fun twist to try one night to change it up! Thanks for posting! I made this for dinner tonight, it was a great hit! Thank you for the recipe! Looks like a great time saver! Thanks a lot Jackie, for giving me another on-line kitchen store to look at obsessively! I am like you and do almost all my shopping on-line. Who has time to go to actual stores?? Fun giveaway! 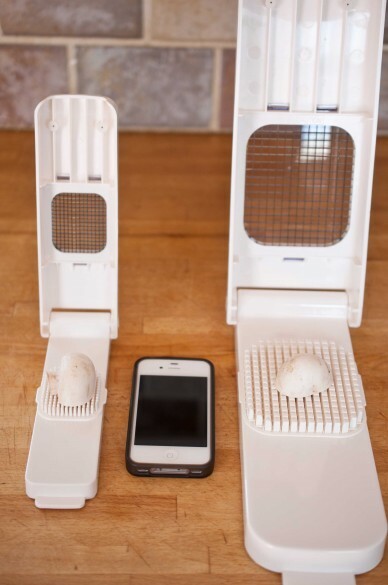 These are handy little things to have in the kitchen, I hope I win! This looks like a blast! I would dice up a storm with this! That is an amazing gadget! Thanks for the giveaway! I’m going to have to give this recipe a shot. And a give away? Sign me up! 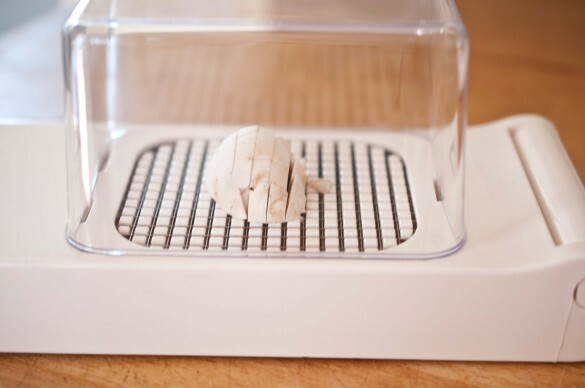 Would love these dicers!!! Would make quick work of vegetables!!!!!!! !